It’s important to develop students’ ability to write without much preparation. The tasks may take only ten or fifteen minutes or be even shorter. Such tasks will considerably boost students’ confidence. Sentence completion – dictate part of a sentence and ask students to complete it about themselves. This can be also extended. Just about any incomplete sentence can be used in this way. Write nonstop for a set period of time (10–20 minutes). Do not make corrections as you write. Keep writing, even if you have to write something like, "I don't know what to write." Write whatever comes into your mind. Do not judge or censor what you are writing. It makes you more comfortable with the act of writing. It helps you bypass the "inner critic" who tells you you can't write. It can help you discover things to write about. 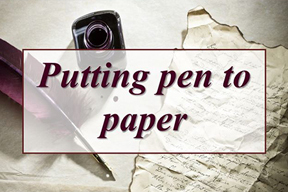 It can indirectly improve your formal writing. Collaborative writing has the power to foster the writing habit in a unique way as it allows students to learn from each other. Dictogloss – students recreate a text that the teacher reads to them. One purpose of the activity is to focus the students’ attention on specific items of language. Dictogloss is useful for vocabulary acquisition too. And on top of that it is especially appropriate for building the writing habit. The fist time the students hear the story they just listen without making any notes. Then in pairs they discuss what they have heard and try to establish the main facts. After that they are going to hear the story again. This time students take notes now they will concentrate on both the language and the facts. Each time students hear the text again they are to reconstruct the story more accurately working in groups of 3 or 4. In trying to write a text collaboratively the students have been provoked into using what they have heard and any other language they know to help write the story. Expanding sentences – students are presented with a stereotypical statement and are asked to amend it to reflect the opinions of the group. E.g. : Boys like football. Girls like shopping. Rewriting sentences – take the sentence and put far more detail into it. E.g. :The woman saw the man. The students have to expand the sentence with as many words as possible. This activity can be made competitive by making the winning pair or group the one which produces the most words with the fewest mistakes. Story circle all the students in a group are sitting in a circle. Each student has a blank sheet of paper in front of them. The teacher dictates a sentence (e.g. Once upon a time a beautiful princess lived in a castle by the river). They all write it at the top of their piece of paper. Each student is told to write one sentence. Once they have done it, they all pass their piece of paper to the left and each student writes the next sentence of the story. This procedure continues until each student has their original piece of paper in front of them. They are told to write the last line of the story. This activity encourages students to analyse their partners’ writing and besides is real fun!